Dr. Victoria Slocum holds a PhD in Special Education as well as certificates in assistive technology, cognitive disabilities, behavior disabilities, and learning disabilities. Her present research focus is the inclusion of people with intellectual disabilities in their faith communities. 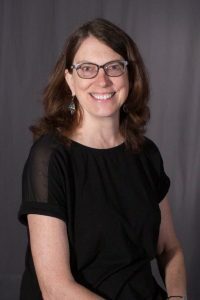 As Director of Academic Accessibility Resources, Dr. Slocum serves as a disability subject matter expert for the University, coordinates appropriate accommodations for students in the classroom and in the use of facilities in order to provide equal access to educational opportunities at Asbury University. Dr. Slocum is married to the Rev. Dr. Robert Slocum, an Episcopal priest and Narrative Medicine Program Coordinator at the University of Kentucky HealthCare. They live in Danville, KY.
Ault, M. J., & Slocum, V. (2013, November). They’re everybody’s kids: Collaboration and inclusion in school settings. Kentucky Council for Exceptional Children Exceptional Children’s Conference, Louisville, KY.
Slocum, V. (2013, November). Welcome regardless: Recommendations for including people with intellectual disabilities in faith communities. Poster presentation, Kentucky Council for Exceptional Children Exceptional Children’s Conference, Louisville, KY.
Slocum, V. (2014, February). Welcome regardless: Recommendations for including people with intellectual disabilities in faith communities. Episcopal Diocese of Lexington Annual Convention, Covington, KY.
Ault, M. J., & Slocum, V. (2014, November). They’re everybody’s kids: Collaboration and inclusion in school settings. Invited presentation, Kentucky Council for Exceptional Children Exceptional Children’s Conference, Louisville, KY.
Ault, M. J., Carter, E., Collins, B. C., Jimenez, B., & Slocum, V. (2015, December). Efforts to improve the inclusiveness of faith communities. TASH Conference, Portland, OR. Jimenez, B., Slocum, V., Baggerman, M., & James, M. (2016, June). Efforts to improve the inclusiveness of faith communities. American Association on Intellectual and Developmental Disabilities Conference, Atlanta GA.
Shurr, J., Bouck, E., Cihak, D., Slocum, V., & Test, D. (2018, February). Life skills instruction for students with intellectual disability (ID): Best practices and future directions. Invited presentation, Council for Exceptional Children Special Education Convention, Tampa FL. Slocum, V. (2018, June). Using video modeling plus a system of least prompts to teach people with intellectual disability to participate in faith communities. Poster presentation, American Association on Intellectual and Developmental Disabilities Conference, Saint Louis, MO. Slocum, V., Ault, M., & Collins, B. (2015). Perceptions of clergy on inclusion of people with disabilities in their congregations. Slocum, V. (2016). Using video modeling and a system of least prompts to teach people with intellectual disability to participate in faith communities. Dissertation.